Susan has over 15 years teaching experience at studios and universities nationwide. Susan is known for her specialized approach to training dancers that integrates her knowledge of anatomy, kinesiology, and Pilates with classical technique. Her dance training includes master teachers JoAnna Kneeland, David Howard, Frano Jelincic and Dagmar Kessler of the English National Ballet. She has studied at London Contemporary Dance School and with artists from the Royal Ballet at Middlesex University in London. 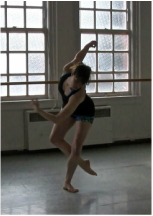 She has an MFA in Dance from UNC-Greensboro and is a certified Comprehensive Pilates Instructor. Additional training includes dance kinesiologist Karen Clippinger, Franklin Method workshops with Tom McCook and somatics with Dr. Jill Green. Susan has performed with ballet and modern companies in Colorado, New York, North Carolina, Virginia, Washington and West Virginia, and with independent choreographers Gerri Houlihan, B.J. Sullivan, KT Niehoff, Bradley Parquette and Talani Torres. Susan also teaches all levels of ballet and modern for the Dance program at WWU and has presented her dance conditioning workshops around the country.